In a very short time, Kurt Russell went from being a supporting actor at Disney to being a leading man. His first headlining role was in 1969 with the first Dexter Riley film, The Computer Wore Tennis Shoes. It was so successful that it quickly made him the studio's most bankable star. They were quick to find him another project before returning to the Dexter Riley formula. 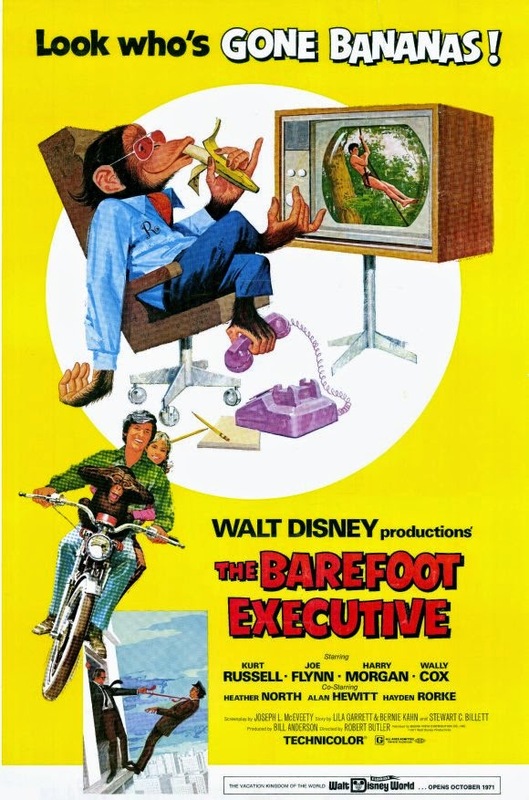 1971's The Barefoot Executive was in the same spirit as The Misadventures of Merlin Jones and The Computer Wore Tennis Shoes and must have seemed like a guaranteed hit at the time. Drawing even more similarities to The Computer Wore Tennis Shoes, both films share the same director (Robert Butler), writer (Joseph L. McEveety) and producer (Bill Anderson). The two even share a few supporting cast members, including Joe Flynn and Alan Hewitt. And the theme song, "He's Gonna Make It," was written by the same team that wrote the song for Computer (Bruce Belland and Robert F. Brunner). Heather North plays Kurt Russell's girlfriend and if her voice sounds familiar, it's because she's the voice of Daphne in Hannah Barbara's Scooby-Doo series. This is also the film debut of John Ritter, five years before becoming a household name on Three's Company. The film was mostly shot on the Disney Studio lot, with one week of location shooting in Long Beach, CA. Steve is a mailroom clerk at UBC trying to move up, but nobody will listen to his TV ideas. When he comes to the realization that his girlfriend' Jennifer's chimp always watches the highest rated TV programs, he uses his uncanny knack for picking hit shows to climb the corporate ladder behind her back. When a jealous coworker discovers his secret and reveals it to his bosses, the network execs try to steal the chimp to edge him out. Their attempts are foiled, but when they offer Steve money to buy the chimp, he has to choose between wealth or doing what's right. The Barefoot Executive was released on March 17th, 1971. It received mixed reviews and wasn't successful on the same level as The Computer Wore Tennis Shoes, despite all of the similarities. It made its Wonderful World of Disney TV debut in 1972 and was released on home video for the first time in 1985. The best word to describe this film is "cute." 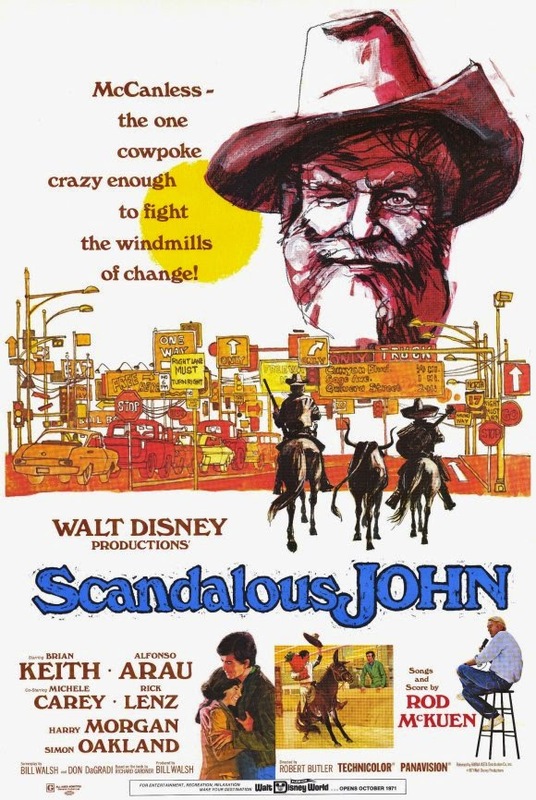 All of the actors are likable and if you've seen a lot of Disney movies from the 60's and 70's, this one is full of familiar character actors. The premise is clever and fun, but isn't quite enough to fill a feature film. There's a lot of obvious filler with jokes that never really pay off. The funniest moment is a running joke about how the chimp likes to grab a beer during commercial breaks. But with so much done right, it's hard not to enjoy The Barefoot Executive. Among the programs Steve shows the chimp is a clip from Babes in Toyland. The film grew in popularity over the years thanks to Kurt Russell's star power and multiple TV airings. In 1995, Disney did a TV remake for Disney Channel. The Barefoot Executive is currently available on DVD. It is presented in open matte fullscreen, which looks like a VHS master. The colors are over saturated and there is a lot of dust in the print. It was recently restored in HD and its available digitally through all major providers. The colors seem more natural, dust has been removed and it is presented in widescreen (1.66:1, although the correct aspect ratio would be 1.75:1).